By Michael Hortig (from Blues & Rhythm 2007) - This now-historic article is over a decade old and an example of some of the finest scholarship ever written about blues pianists. Quite by chance I found the `Online Texas Death Index', where death certificates from 1890 to 1976 are available. 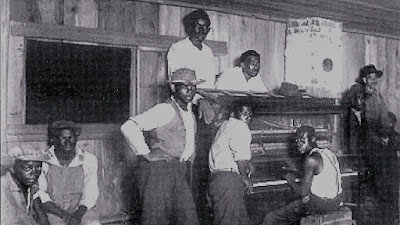 Much biographical data of little known pianists such as Black Boy Shine, Bessie Tucker, and Wilson `Thunder' Smith have been found, providing the background for this two-part article on Texas Blues Piano. Texas always had a big blues tradition — Ramblin' Thomas, Texas Alexander and Blind Lemon Jefferson—some of the most significant early blues artists came from Texas. While the black population from other regions in the south like Mississippi or Alabama migrated north to Chicago, Memphis or St. Louis, the Texas population had big cities in their own state, like Houston, Shreveport or Dallas. The black population in Dallas increased from 9,000 in 1899 to 50,000 in 1930. However not only the big cities provided work. Texas was rich with many kinds of industry. The oil country around Houston or Beaumont, the sugar-refineries in Fort Bend County, seaports like Galveston, and lumber and turpentine industries in the eastern parts, bordering the state line with Louisiana, and all those connected with legendary railroad lines like the 'Santa Fe', 'Rock Island' or the `Texas & Pacific'. This provided the background to entertainment such as drinking, gambling, whoring, and dancing, with a great demand for musicians, especially piano players. Entertainment could be found in often rough and violent barrelhouses, where cheap booze was drawn direct from the barrel: "Up and down the Santa Fe tracks in those days, these were known as the barrelhouse joints. You play all night long, and they danced all night long. And the blues was all they wanted" — (Buster Pickens). After the pianists had finished, they rode the train to the next job: "These other piano players, Son Becky, Andy Boy, Conish Burks, they went out different routes, hardly ever paired up, each lookin' for his own bread" — (Buster Pickens). Many of them were crippled from riding the blinds, like the legendary Peg Leg Will. Others were murdered like Wilson Smith and Buster Pickens, or died of pneumonia and TB: "You play in those hot places and run out in the cold and chill air . . . gives you pneumonia". NB: The blinds were the walkway between two passenger cars covered with either canvas or leather in an accordion shape, there was a ladder running up to the top of the car in this space and the hoboes would hold on to the ladder. All this led to a very distinctive style of blues piano playing with a variety of stride, boogie or chorded patterns in the left. and a technically high standard of melodic structures in the right hand. They also didn't use only the eight or twelve bar forms, usually used by blues pianists of their time, they had nine, eleven, thirteen, fourteen or even 24 bar forms. The first Texas pianist to record seems to be Bert M. Mays, who recorded four titles in Chicago in November/December 1927 for Paramount. His playing and his use of piano and vocal-effects puts him close to a group of Dallas based musicians who recorded between 1927 and 1929. In 1928 and 1929 Mays recorded ten more titles for Vocalion, from which only two have been released. Although he recorded an 'Atlanta Blues', a 'Milwaukee Scrontch' and a 'Michigan River Blues', his version of 'You Can't Come In' suggests a southern background. Between 1927 and 1929, Columbia made recording trips to Dallas, where they recorded Dallas based musicians like Whistlin' Alex Moore (see Part II), Texas Bill Day, and Willie Tyson. Around 'Deep Ellum' or 'Central Tracks', the heart of Dallas' black community, the pianists created their own 'Dallas style', slow or medium-paced and 'Bucket Of Blood' was a celebrated number. Joe and Fred Curtis, Frankie Allen, and Bobby Bryant were familiar names, but never got the chance to record. About Texas Bill Day, nothing is known: Alex Moore remembered a Bill Day, who lived in Pickett, Texas. Day recorded six sides for Columbia with strong links to Dallas, as in 'Elm Street Blues': "Ellum Street's paved in brass, Main Street's paved in gold." Next to record was William (Willie) Tyson. Born on 15th September 1908, he recorded two unissued piano solos, 'Roberta Blues' and 'Missouri Blues' on 5th December for Columbia. One day later, he accompanied Hattie Hudson on her classic sides 'Black Hand Blues 'and 'Doggone My Good Luck Soul'. Hattie Hudson is believed to be Hattie Burleson (born 27th July 1897 in Bastrop County, died 13th November 1953 in Houston) who recorded the Texas classic 'Jim Nappy' in 1928. Tyson, who also accompanied Gertrude Perkins, Billiken Johnson and Lillian Glinn (1902 to 1970s) on record died on 30th September 1956 in Corpus Christi. K.D. Johnson became famous for accompanying two of the best female blues singers, Bessie Tucker (born 1907, died of TB in Dallas on 6th January 1933) and Ida Mae Mack (born 28th August 1902 in Sunset, Louisiana, died 3rd October. 1951 in Houston from uraemia and diabetes), K.D. 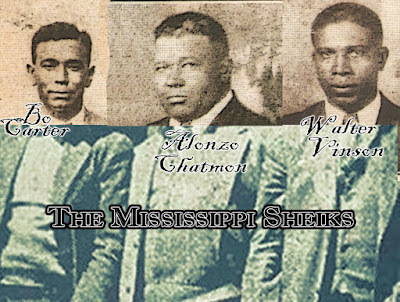 Johnson, born on 8th January, 1900 (or January 1899 as the 1900 census says), accompanied Tucker and Mack on their legendary session for Victor on 29th and 30th August, 1928 in Memphis. Johnson was remembered by Alex Moore as '49'. Mack didn't only credit known as 'forty-nine shows'. He accompanied Tucker in 1929 together with Jesse Thomas for Victor in Dallas. His piano style, consisting of hammered chords in the right, and a variety of bass figures from stride to early boogie forms, fitted perfectly to the irregular tempo and the moaning singing of Tucker and Mack. Speculations have been made if Johnson had been their pimp and why they didn't record again? Maybe the clue is Johnson's death some three months after the last session on 30th May 1930 in Waco, due to TB, and the death of Tucker only three years later, facts, which were not known until now. Another regional piano style was developed around Shreveport. Dave Alexander, who recorded under the name of 'Black Ivory King' in 1937 for Decca, and Dusky Dailey, who had two recording sessions in 1937 and 1939 for Vocalion, are generally known for recording a railroad piece 'The Flying Crow', which originated around Shreveport (guitarist Oscar Woods, also from Shreveport recorded this tune). It seems that Dailey was more a band pianist, not only for his later records with his band, but two of his four issued solo sides are pop numbers. Alexander fitted his nickname well because three of his four recordings are played in the keys of A, Eb, and Ab. He also reworked the Walter Roland classic 'Red Cross Store' with his own 'WPA Blues'. Virtually nothing about these two outstanding artists has been found. The same goes for Big Boy Knox, who recorded four sides for Bluebird on 2nd March, 1937 in San Antonio. Some lines in 'Texas Blues' say that he was born in Louisiana and now is going to make Texas his home. Frank Tannehill, born on 17th July, 1906 in Austin, first recorded in 1932 in Dallas as accompanist for Pere (Perry) Dickson. Under his own name, he recorded in 1937 for Vocalion in Chicago, 1938 for Bluebird in San Antonio and 1941 in Dallas. Over this period Tannehill changed his style from a heavy stride influenced, to a mellow, slow and sophisticated one. During his last session, he also recorded a pop tune, 'Lillie Mae' that may indicate that he had changed from the barrelhouse circuit to a socially better audience. He died in Dallas on 27th April 1943. However, the most powerful group of pianists working all around Texas but playing in a similar, technically outstanding style was the so-called 'Santa Fe Group'. Pianists of that loose group came from Galveston, Houston, Richmond, Sugarland, and even up from the Piney Woods. When this group started to develop their style is not known, but Robert Shaw, who survived into the 1960s, was still able to play that complicated and complex style and dated it around 1920. He describes it: "It's very peculiar and takes a lot of practice." One bass figure, originated by a man with a lame hand, was to chop the keys with the edge of the left hand. They could even manage to play rag, blues and boogie basses, and, unlike other blues pianists of that time, they used to play in nearly all keys of the piano. Although some of the most famous pianists of that group were recorded, a legion of others remained only in the memories of Shaw: "Jack Coleman, he was bad, drank all night and we've got another boy Lester (Rusty) Johnson, he was kind of short. Or take Peg Leg Will, he was six feet tall and weighed Pigmeat Jarrett, who met him in Cincinnati in the 1930s. After his last session in Dallas on 14th June, 1937; he dropped out of sight. only seen by Buster Pickens in 1948. health wrecked by TB. Harold Holiday died on 28th March, 1952 due to TB in Sugar Land, and was buried in Stafford, Texas. Next to record was Conish `Pinetop' Burks. Born on 7th August, 1907, it was said that he was raised near Richmond. He was remembered by Shaw: "Connie Burks, a dark fellow, about my size, maybe a little thicker than me. When I met him, he couldn't play, so I showed him some Three years later, when I was in Richmond again, he played better than me". His recorded output of six titles, made for Vocalion on 25th October, 1937 in San Antonio, show him as a pianist with an incredible technique and melodic feeling. His 'Mountain Jack' is his version of the 'Grinder'. his Fannie Mae' is the classic Hattie ' ' Green', and with Jack Of All Trades Blues', he recorded another Texas-classic. 'Shake The Shack' is a version of Pinetops Boogie Woogie', which is played both with boogie and Texas bass figures. He also dropped out of sight in the late 1930s, and he died on 11th January, 1947 in Corpus Christi. On 3rd April, 1934, the singer Joe Pullum from Houston recorded 'Black Gal, What Makes Your Head So Hard', which became a nationwide blues hit, recorded by others like Leroy Carr, Mary Johnson, and Jimmy Gordon. This number was a trademark of the 'Santa Fe Group', and the reason that these musicians have never been lost in the obscurity of blues history. On this and two other record sessions, pianist Rob Cooper accompanied Pullum. His style had many links to stride /ragtime piano; his use of 'tens' in the left-hand shows him as a very accomplished piano player. Shaw: "Robert Cooper was a youngster, the man who made 'Black Girl' with Pullum. We called him 'Perdue' (`Parduke'). He stayed in the Third Ward, Pullum in the Fourth Ward. He used to play with a band for a while, but when they split, he went up north to Chicago, and I've never seen him again". He recorded two versions of 'West Dallas Drag' under his own name, being his version of the 'Ma Grinder'. He did two more solo pieces, with Joe Pullum speech only: 'McKinney Street Stomp' and 'Blues With Class'. His last recording date with Pullum, who normally was accompanied by a pianist named Preston Chase, was on 25th February, 1936, and together with Chester Boone on trumpet and Melvin Martin on guitar, they recorded another Texas classic 'Hattie Green'. Guido van Rijn found an advert in the Chicago Defender of the 16th March, 1946 about a Marvin Cates and his Earls of Rhythm, featuring a Robert Cooper (piano, vocals), but this is unconfirmed as the Texas man. Nothing else could be found on Rob Cooper. Also only a few facts are known about the last musician of the 'Santa Fe Group', Andy Boy. It has been suggested, that boy was his real surname, but no evidence of an Andy/ Anthony/Andrew Boy have been found. Shaw remembers him as: "He was a little fellow, just a little older than me. He was the top kicker of Galveston". Only a few clues in his recordings seem to have biographical character: 'I have been born on Church Street'. Of all in the group, he was really the top player. Ragtime, blues and jazz elements in the left hand were combined with runs or incredible chord clusters in the right hand. His 'House Raid Blues', recorded on 24th February, 1937 in San Antonio has poem-structure, which was never used before or later. Andy Boy sings about an evening in Charlie Shiro's club in Galveston, where Andy Boy: 'Now it was four day in the morning when the shack's got raided...and: 'I'm playing the blues, down at the pool, just whippin’ that ivory board, just like a fool, then my hands got sore, somebody say, the law is at the door, so Andy Boy let go', and: 'I left so keen, I left, like a submarine. Couldn't hardly be seen.